There was an undeniable sense of unpredictable predictability before this race even started. 52 laps and an hour and a half later, that came to fruition. 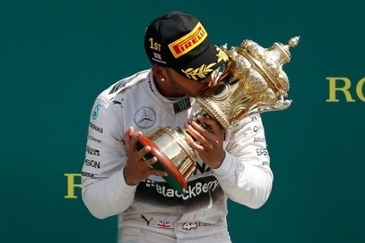 Lewis Hamilton won the British Grand Prix for the third year in a row. With the aid of a safety car, the Briton cut teammate Nico Rosberg’s championship lead by a further 10 points, now going to the mid-season race in Hungary separated by a solitary point. With Hamilton’s fourth victory on British soil, he became the most successful driver on home turf, matching Nigel Mansell’s four victories (one of them came at Brands Hatch). Despite the rain fall actually stopping before the start of the race, the race began behind a safety car, with FIA Chief Charlie Whiting keeping the race as it was for the opening five laps. Despite the initial downpour, Hamilton, who led for every lap of the race aside from when he changed from intermediates to slicks, left the track crowd surfing a wave of unbridled joy. Literally. 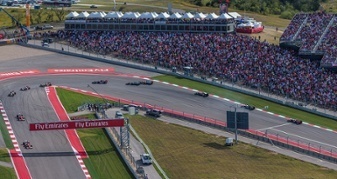 Rosberg and Red Bull’s Max Verstappen filled the places on the podium. Hamilton’s day got better when Rosberg, who initially finished second, was demoted to third after he suffered a gearbox failure which led to the German receiving a penalty for the second consecutive race. Race stewards handed him a 10-second penalty after the detail of the help Mercedes gave him over the radio, which transgressed limitations on the amount of help drivers can be given by teams. Shortly after the race, Mercedes confirmed they will appeal the decision. 18-year-old Max Verstappen once again showed undoubted class and awesome speed as he gave Rosberg a serious run for his money and eventually finished runner-up again to Hamilton. Without question, we are witnessing the emergence of the next great talent in F1™, and a champion in-waiting. One begs the question, should Red Bull driver Max Verstappen get a competitive vehicle underneath him, the whole landscape of the Formula 1™ will be shifted in the shape of Verstappen. What Did We Learn from Silverstone? Despite Mercedes’ continued dominance, Red Bull’s speed proved they are not too far away. This was a weekend that marked a change in the fortunes of the Milton Keynes-based constructor. Now 18 points clear of Ferrari in the constructor’s championship, Verstappen’s RB12 oozed poise, especially under these testing conditions. On the other end of the scale, Sebastien Vettel endured yet another disappointing race, finishing a lowly 9th position, now currently fifth place in the championship. The four-time world champion, who was regarded as the Mercedes monopoly this season, has failed to live up to the hype in 2016. At the halfway point in the season, one point separates Rosberg and Hamilton. It is hard to conceive anybody but one of the Mercedes’ drivers claiming the title. Who? That’s too close to call at this point of the season, a flip of a coin, really. As we move towards the business end of the F1™ season, don’t miss your chance to experience it all up close and personal. Kick off your Formula One Paddock Club™ access with Grand Prix Experiences – it’s literally the best seat in the house! Enjoy the luxury that the Paddock Club offers with privileged views of the race, gourmet food spreads, an exclusive Pit Lane Walk, access to the Support Race Paddock, and much, much more!